Brutal, melodic and different. This is what could be said about DASH THE EFFORT. Combining the heavy and dark matter of the metal music and the new alternative styles, since its formation in 2011 the band developed its own and unique sound, taking the term "metalcore" and expanding it. The melodic riffs mixed with heavy vocals and ambient electronics further make the music of Dash the Effort both versatile and memorable. The band was formed in Sofia, Bulgaria by Joro (current guitarist) and with its debut EP "Polar Dawn" the band became one of the leading bands in its country. Winning the first ever W:O:A Metal Battles, Dash the Effort became the first bulgarian band who ever played at Wacken Open Air Festival. But the band's concert history doesn't end here. Along with many nationwide tours, the band also played with bands like Stone Sour, Bling Guardian, Unearth, Jinjer and many more. With their new album "Decadence"(2018) Dash the Effort prove that when it comes to making music nothing is impossible and pushing the limits is something that is necessary for the quality music. SCARS OF A STORY was born from the desire to give the metalcore genre a new and more melodic interpretation. After a strong debut on 7th May 2012 opening for Cancer Bats, the band continues honing their songs in preparation for their first album. 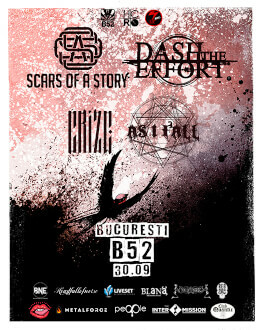 After sharing the stage with international bands like Subscribe, Betraying the Martyrs,Veil of Maya,In Other Climes, Violent Chapter, Jinjer, Hopes Die Last and romanian bands like Goodbye to Gravity, Diamonds are Forever, Breathelast, Divided by Perception and For the Wicked the band developed further. In the summer of 2016 the first album called „Behind your so called comforts” was released to positive reviews. The band is currently working on new material whilst promoting their first album throughout the country.